Traditionally, Moroccan cuisine makes use of tagine pots, a special piece of cookware that does a great job at braising meats at a low temperature. I don't have a tagine nor is it really necessary to cook with one for good Moroccan fare. In fact, you could use a Dutch oven or even a slow cooker/crockpot, just as I have done to prepare this dish. The chicken is coated with a mix of spices before browning. Then the chicken is placed in a slow cooker/crockpot along with other ingredients and slowly braises. 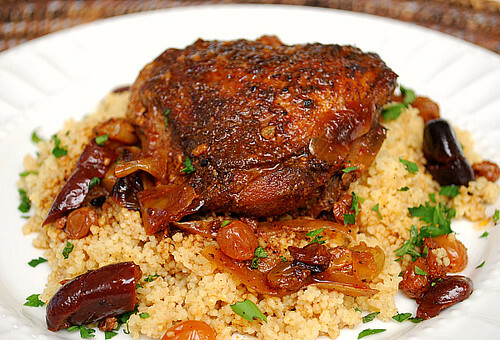 The result is an extremely flavorful and tender chicken dish, that's best served with couscous or even rice. 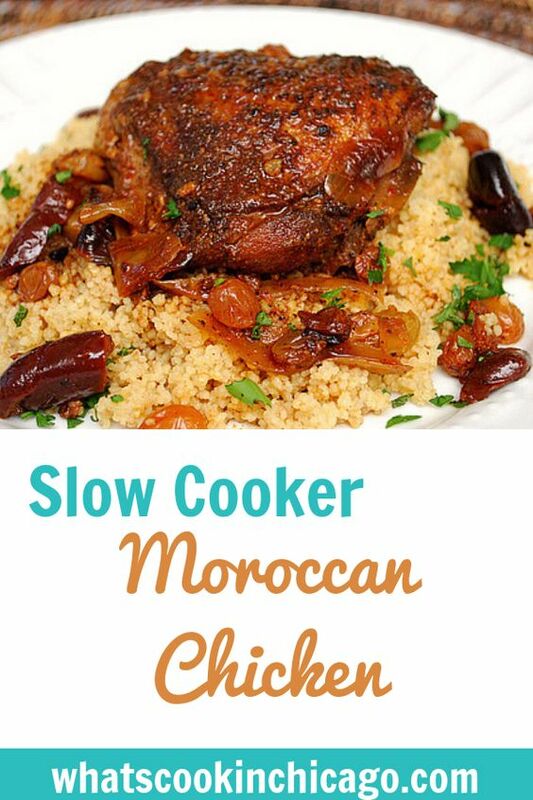 I've included a tip on how to make this dish ahead of time and/or for your freezer so a good Moroccan dish is never too much effort to make! Combine paprika, cumin, ginger, coriander, 1 teaspoon salt, 1/4 teaspoon black pepper and 2 tablespoons olive oil in a large bowl. Pat dry the chicken thighs with paper towels, then place in the bowl with the spices. Coat chicken with the spices. Heat the remaining tablespoon of olive oil in a skillet over medium heat. Add half of the chicken thighs, skin side down, and cook without moving until lightly browned. Flip chicken and continue to cook until second side of golden. Transfer browned chicken to a plate and set aside. Repeat with remaining chicken thighs. Place chicken in a slow cooker/crockpot. Add onion and water to the same skillet and return to medium high heat. Cook, scraping the brown bits on the bottom until the onion has softened and begins to brown. Place the onions in the slow cooker/crockpot. Add the minced garlic, bay leaves, raisins, lemon peel, olives and chicken broth to the crock pot. Cover and cook on low for 4-6 hours or high for 2-4 hours. To serve, add lemon juice to dish and stir. Season with salt and pepper to taste. Pour sauce over the chicken and sprinkle with parsley or cilantro. * To make ahead/freezer meal - Prepare chicken as directed above and allow to cool. Place cooled, cooked chicken in a gallon sized freezer bag. Prepare the onions as directed above and place in the same gallon sized freezer bag. Add the minced garlic, bay leaves, raisins, lemon peel,and olives in the freezer bag; seal and freeze. When ready to prepare, defrost completely. Place contents of freezer bag in a slow cooker/crockpot. Add the chicken broth to the slow cooker/crockpot and cover. Cook on low for 4-6 hours or high for 2-4 hours. To serve, add lemon juice to dish and stir. Season with salt and pepper to taste. Pour sauce over the chicken and sprinkle with parsley or cilantro. Great dish full of great flavors! I have a similar recipe, only using chopped dates instead of the golden raisins. Give it that hint of sweetness to cut the spiciness. This chicken looks amazing and so full of flavor. I'm bookmarking this recipe and will make it for my mom. We made this the other night. It was great and the chicken just fell off the bone! Yum! Made 1/2 tonight and put the other half in the freezer to make later. We both loved the recipe! Thanks so much for posting! If you are preparing for the freezer do you slow cook the chicken then put in the freezer and slow cook again? Or do you just brown the chicken and bag it for the freezer and then slow cook it later? Bethany, for a freezer meal, I brown the chicken, let it cool and bag it for the freezer. The chicken finishes cooking when it's slow cooked in the crockpot along with the rest of the ingredients. Question--do you take the skin off the chicken before cooking? The ingredient list says bone-in skin-on, but then it says skinned and trimmed of fat. Could I use bone-in skinless instead? Hi CraftyBeth - sorry for the confusion! I've updated it to reflect skin on, trimmed of excess fat. You can certainly use bone in skinless instead for something leaner. The skin on really serves as a way to impart flavor and color since the chicken is browned first before cooking in the crockpot. When you say - Cover and cook on low for 4-6 hours or high for 2-4 hours. What temp would you suggest for the oven? Hi Anonymous - if you were making this in the oven, I would bake in a 350 degree oven for 45-50 minutes, checking that the chicken is cooked completely. This is a very tasty recipe..thank you!! I have a question about your freezer method though. Is having uncooked (or undercooked) chicken cooled, frozen and reheated safe? I've never done anything like that before so it feels odd. I've only ever put raw, or fully cooked things in the freezer. 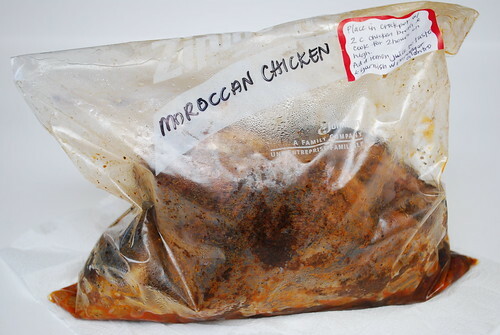 browsed some responses here "Moroccan Chicken". comments come across like they are left by brain dead visitors? networking pages like your linkedin profile, Facebook page or twitter feed? In the slow cooker, can you use chicken breasts instead of thighs?